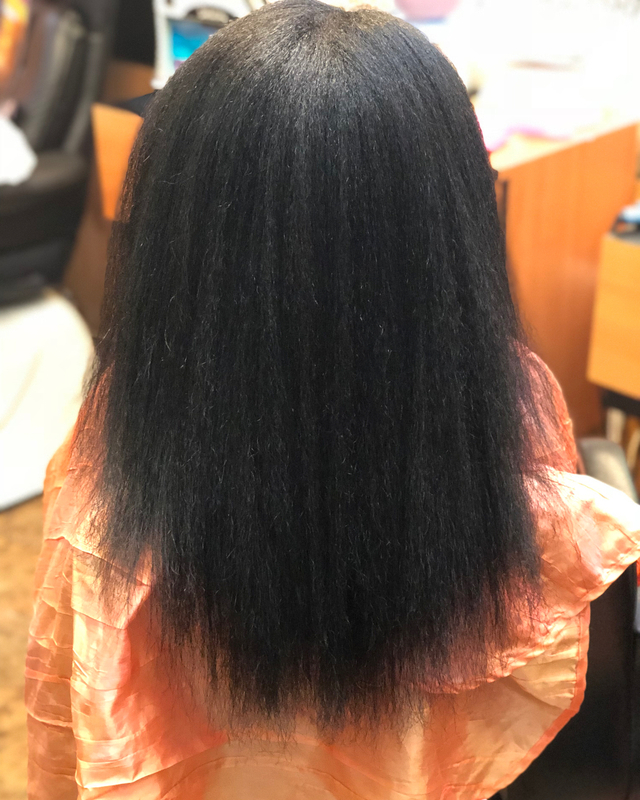 Chances are, if you have natural hair, you’ve had or thought about getting your hair straightened. The bouncy, shiny hair that a silk press offers is a hard call to ignore yet the style is often met with skepticism. How can you get such great results without major damage afterward? Some people just aren’t willing to take that risk. For those of you still on the fence, we’ve compiled a list of pros and cons to help you make an informed decision. Unlike the press and curls of yesteryear, a silk press does not require heavy grease or oil to straighten hair. Actually, using grease in conjunction with straightening tools can burn and weigh the hair down. A silk press, on the other hand, uses serums that offer a light coating. As a result, your strands are more protected from the heat of a flat iron and if done correctly, your hair will have a lot of body and movement. Split ends are hard to spot on curly hair; the sheer volume can lead us to believe it’s healthy. Straightening is helpful in that it forces us to examine damaged, straggly ends and cut them off. If not, the hair inevitably splits up the shaft, leading to breakage and thinning. One of the more obvious reasons to silk press is to get a new look. Natural hair is versatile, no one can deny this point but sometimes, you just want something different. Length is one such difference. Curly hair by nature is shrunken, appearing shorter than its actually is. After months of putting in hard work, it can be rewarding to clearly see progress and show off the fruits of your labor. Many natural styles can be a pain to maintain during the week. Rod sets, twistouts, braidouts, etc can come with a lengthy nighttime routine (unless you’re a fan of pineappling). A silk press simply requires wrapping for maintenance which takes far less time than moisturize, seal, retwist. Much like the nighttime routine, waking up to style a silk press is no major feat. If properly wrapped at night, styling should be as simple as removing bobby pins and combing your hair out. Any other styles will be easier to accomplish due to the lack of volume. When it comes to a silk press, getting sleek results can be near impossible. Youtube tutorials make it look easy but any wrong move and you’ll have subpar results, convincing yourself you “weren’t going for the bone straight look” anyway. If you aren’t confident in your skills, best seek out a professional to help you along. It might be expensive but the end result will be well worth it. Wetting your hair after a straight style is a pivotal moment. We’ve all had those thoughts, “it’s taking too long to curl up”, “my hair wasn’t this loose before” - checking to make sure no irreversible damage has been done. We mentioned above that a silk press is safer than the usual press n curl and that’s true but when using heat there’s always a risk of heat damage. Natural oils can’t easily travel down the hair shaft of coiled hair. This is why many curlies opt out of washing their hair every day - it would get too dry. This isn’t the case for straight hair. After a couple of days, the hair can appear greasy and weighed down which is not a good look. Your hair will sweat out and much like new growth to a perm, the difference in textures can cause breakage. This is apparent while combing. It’s tempting to flat iron your roots but this is a temporary fix that will only harm your hair in the long run. If you’re not ready for wash day, try the saran wrap method to stretch the style. Depending on how often you silk press your hair, you could greatly increase your split ends. Heat in moderation can be a helpful tool but too much will sap the moisture from your strands, making them vulnerable to damage. One way to counteract this is to deep condition before and after straightening.